For some companies, they have the right model or at least the right tools. That being said, if they don’t have their entire team onboard, their lead campaign is doomed before it even starts. Your entire team HAS to be willing to play ball. Further complicating the lead gen and nurturing process is the matter of analytics and stats gathering. Your intentions can be good, even great, but they won’t get you far if you aren’t collecting data on every movement your customers make in your funnel. Then, you need to constantly analyze your audience to properly segment your lists, create content that resonates, and to find success. These issues aside, each lead nurturing model has its own pitfalls. Let’s tackle some of the more popular ones. Content marketing is synonymous with “marketing” and “lead gen” in today’s market, according to 89% of marketers and any number of surveys. Yet, only 49% of B2B marketers are using sales lead quality to determine the effectiveness of their content marketing. That means a large portion of marketers are using the right tool, but not tapping into its potential. For the food lovers out there, calling content marketing “effective” without judging lead quality is like judging a steak without first cutting into it. This happens for a multitude of reasons. First, it’s easy to overlook lead quality as one of the metrics for content marketing effectiveness. In fact, most B2B businesses associate effective content marketing with simply driving traffic or conversions, NOT the quality of those conversions. Second, it can be downright difficult to determine what quality leads your content marketing is bringing in. This is largely due to the difficulty of tracking across all of your channels. Fortunately, this is becoming an issue of the past as tracking evolves, with Google Analytics leading the charge with it’s multi-channel funnels. Many think email is outdated or dying. To put it simply, those people are wrong. As published in Campaign Monitor, email still delivers an ROI of $38 for every $1 spent, making it a great performer. Unfortunately, there are still a number of places email marketing can fail due to misguidance or a lack of experience. One of the more common mistakes made with email marketing is a failure to segment your email sends. This is also known as the one-size-fits-all or blanket approach. While your target audience may be similar in a lot of ways, a blanket approach with your email can still leave many of your leads feeling left out, misunderstood or turned off completely. Because emails are a lot smaller than a piece of web content, you also have to be more conscious of your space. An email that uses too many or too few images, or the wrong type of image, can once again turn potential leads away. An even bigger hurdle is trying to get noticed in a recipient’s inbox. Assuming your email gets past someone’s spam filter, you’re still competing with the other 87 emails an average user receives on any given day. So, how do you turn “you’ve got mail” into interest? You now know how two of the more popular marketing methods are misused. So how can they be used properly in your lead nurturing campaign, and what other tools are available? Glad you asked! There are actually various additional tools at your disposal, each of which has its place. Everyone loves free things. Even when you’re selling to other companies, people want information and they want to avoid paying for it. White papers and eBooks are a great way to attract potential leads at the awareness stage, while also rewarding them with some free, yet very valuable, information. And, this type of content is actually desirable, with 78% of B2B buyers wanting it. For the uninitiated, white papers and eBooks are generally stat-packed, informative pieces of content that provide information on your B2B company, services, and products. Think of blogs as your good content, and white papers and eBooks as your best content. White papers and eBooks are a great place to help leads who are either aware of a problem they’re having, or still figuring out what problem it is they’re experiencing. With this in mind, make sure your white papers and eBooks are extremely informative and helpful, not just pieces of advertising for your company. By being helpful, people are more likely to pursue your company further and become actual leads. Webinars are essentially an online course or lecture on a topic. Think of them like a seminar without the stuffy room and uncomfortable seats. While webinars can be used at any stage of your lead nurturing campaign, they’re particularly effective at the consideration stage of this journey. This is due to their interactive nature, which allows you to ensure you’ve provided your audience with sufficient information on your B2B products or services. To get the most out of your webinars, start by having a great presenter. Then, make sure you’re being concise but helpful, offering useful information about their problem (which they should be aware of at this stage in the journey) and how they can solve it. This will open the door to offering up your B2B services as a solution to their problem. Here is some more content from Marketo, a marketing automation platform, on the ways you can incorporate webinars into your B2B lead nurturing campaign. As previously mentioned earlier in this post, email marketing has a fantastic ROI and can be incredibly effective. Unfortunately, many fail to segment their lists and don’t get the most out of email marketing in their lead nurturing campaign. How do you truly take advantage of email marketing? Start by researching your audience. Then segment your audience into different groups. Go beyond typical age, gender, and nationality groupings. Instead, look at what kinds of hobbies your audience has in common, what kind of devices they’re viewing your emails on, and if they’ve purchased anything from you before. Remember to use the data. Do you have a huge portion of your list that’s been opening your emails for months but never pulls the trigger on a purchase? Send that group a superb deal. As for that group that just signed up? Send them an informative email, letting them know who you are as a brand. Most of all, get creative with your emails to get the most out of them. No email will perform well with your entire base. You need to know your audience and customize emails to fit their likes and needs. For example, memes and cultural references in your emails might speak to a younger audience while a minimalistic email with clear links might speak to an older audience. Content marketing used to be a buzzword. It’s now transcended that and become the all-star of marketing. It can work wonders at nearly every stage of the funnel and journey, and it can have fun doing it. But, as previously mentioned, many aren’t considering the quality of leads as a metric for its effectiveness. To make sure your content marketing is reeling in the right leads, start by doing extensive keyword research. See what kinds of keywords are performing well in your niche, what your ideal customer is searching for, and what the competition is like for your keyword(s). This means going beyond the search volume for a keyword, and looking at what kind of companies are competing with you in that same space, what content is ranking, what your paid advertising costs are doing, and more. The point of this exercise is to create content that speaks to these keywords. Address the questions and concerns being expressed by those googling this keyword. This is especially important if NOBODY has answered the question yet. You’re now the first – because you did your homework. Finally, gate your best content by requiring an email from your visitors, when appropriate. Have you completed an outstanding piece and feel it’s simply too valuable to give away? Exchange an email address from your audience for this quality content. Now you’ve got a lead that’s not only on your list – they’re also interested enough to give you their email. In a sense, they’ve already begun to qualify themselves as a lead. 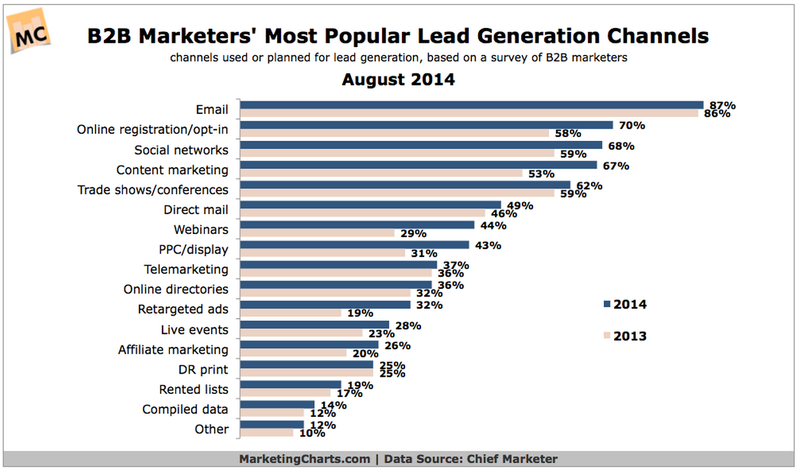 You can’t run a lead nurturing campaign without leads. As mentioned before, gating content is a great way to begin building your list. For this exercise, let’s pretend we’re an online editing company that provides professional editing for clients. And as luck would have it, you have a comprehensive guide on how to spot amateur writers at a glance. You know this content is valuable to your audience, as it could help them save a boatload by avoiding shoddy freelance work, so you require an email in exchange for it. You should also have an email submission form available throughout your site (tastefully placed in multiple places if possible), for those interested in receiving offers, your newsletter, etc. This will ensure you capture a wider audience, not just those interested in weeding out bad freelance writers. It’s time to let people know exactly who you are. What better day to do this, than day one? Send your new subscribers a welcome email that lets them know who you are. Showcase your brand’s colors and language here. It’s also nice to give people a little “thank you” for signing up. This gives you a chance to showcase your team’s abilities, and hopefully win them over as a customer. Finally, close the email with a cordial call-to-action (CTA) that invites the recipient to visit your site. Now that your email recipient knows who you are, it’s time to build their interest in your company. This is a great opportunity to offer them additional content, for free of course. Those webinars we talked about? This is the perfect opportunity to use one. Start by sending out an email to promote your webinar. Give a general overview of what will be covered, how this information can help them, and close with a CTA that invites them to attend. Then, host a webinar exclusive to your list, during which time you can discuss additional editorial-related problems. Not only will this further build trust with your brand, it will also help your audience feel appreciated and special by being in a members-only type session. Also, because a webinar is live, you can take questions throughout and at the end, and further build a repertoire with your audience. If you have interested parties, a live webinar makes it easy to hand them off to sales as well. Now that your list has had two opportunities to get to know you, it’s time to further qualify them using a sales rep. Use this time to send a personal email, opening the line of communication for questions. Make sure your sales team is not being too pushy as these leads still aren’t fully qualified. This can be a great place to have a CTA that directs them to your support or FAQ section. For the people on your list who attended the webinar, send a separate email thanking them for attending. Include a piece of content that summarizes the key points from the webinar, and throw in some bonus content like tips and tricks on said topic. This segment of your audience is clearly more interested than those who didn’t attend, so consider them further qualified. Use this opportunity to provide actual product-related solutions from your company in the attached content. Your audience should be well-aware of your brand and some of your solutions at this point. It’s time to show people what you’re made of with a demo. Because you’re an editorial company in this example, you could use samples of work your team has edited and fixed. Show the change in the quality of work, and provide some stats on how the piece went on to help that client out. Did it boost sales, drive conversions, etc? For example, if you’re a manufacturer, you could use this email to show off the quality and advantages of choosing your products. Or point out any large businesses that have used your products and how that positively impacted their business. Did they boost the number of end clients by using your product or service? And play up the scale of your operation. Have you filled extremely large orders in a short span of time for clients? Call those examples out here! Then close the email with a CTA that directs them to your site or to call (If calling is your thing) so they can learn more about securing your services. At this point, anyone that calls in or submits an inquiry should be far enough along that the sales team is ready to work their magic. For the portions of your list that have yet to convert, don’t lose hope. Continue to send emails occasionally – think every two to three weeks, but not too frequently as they will unsubscribe out of frustration. Whenever you update your services, make sure you inform your existing list of these changes and the new benefits they bring. This is also where content marketing can really help your overall lead nurturing campaign. Yes, again. Continue to create quality content, each piece speaking to different parts of your funnel and the buyer’s journey. While you can’t win them all over, a good piece of content can work wonders. During this entire lead nurturing campaign be mindful of your branding. Inconsistent branding can really turn people off of a company. This is especially true with emails. Make sure your emails all showcase your brand to the fullest. The same goes for your content. Keep your language and colors consistent, and don’t ever send anything boring. Consistent branding will not only reassure people that the content they’re seeing is actually from you, it will keep your brand in their mind down the road. Do you like the advice in this post? We put it into practice daily. You optimize your content for search engines, so why wouldn’t you optimize your content for lead nurture? What is Lead Engine Optimization (LEO)? LEO is the practice of optimizing your lead nurturing campaign. It’s a methodology we designed with a holistic approach to the entire lead campaign. We use marketing automation and concepts that we brought up in this post and customize them to your business. If you want to fix your lead nurturing campaign, LEO can help. With LEO, you take a step back and look at both your funnel and your buyer’s journey to determine where the system is broken in converting the leads into sales, where leads are leaving the funnel, and what tools or approaches might be beneficial or even turn your overall lead process around. A lead nurturing campaign can be a lot of work. A lot can go wrong, meaning a lot of time and money can be wasted. And even for the companies that know how to run a lead nurturing campaign, there’s the issue of manhours and a lot of hands – hands that could be working on another project or marketing initiative. This is where our LEO system comes into play. With our LEO service, the team at Fired Up Digital will examine your entire funnel and buyer’s journey to determine where you’re losing out on lead opportunities, why lead’s aren’t moving forward, and why those at the end of the funnel aren’t turning into sales. Furthermore, we’ll cut out the time-consuming sales follow-up work by automating all follow-up processes. We’ll then collect and organize all stats and analytics into a manageable format for you and your team to view and learn from as well. The sales process can be long and arduous, but it doesn’t have to be. With LEO you can rest easy knowing your leads are qualified, knowledgeable, and signing up for the service they have been needing from you all along. Contact us today for more information on how you can get LEO and stop leading your leads astray.